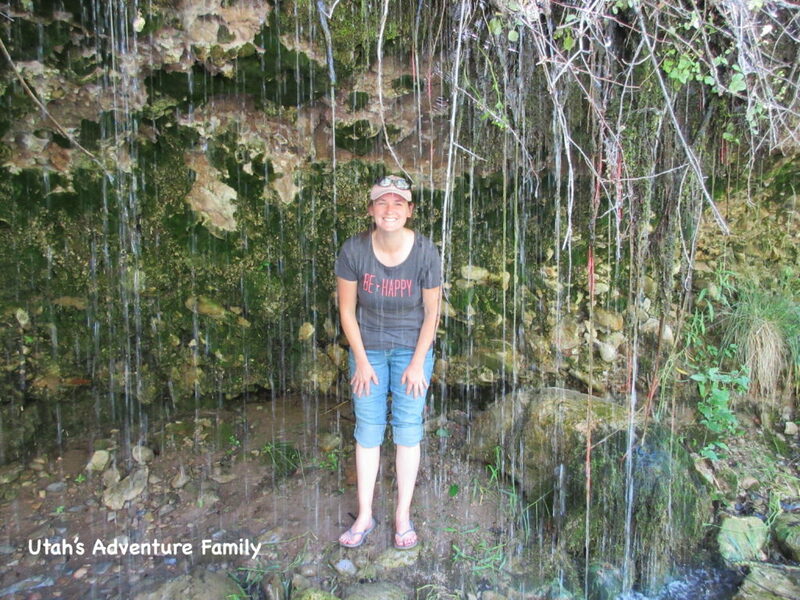 Call it an urban hike or call it a nature walk, Dripping Rock Trail is really fun. 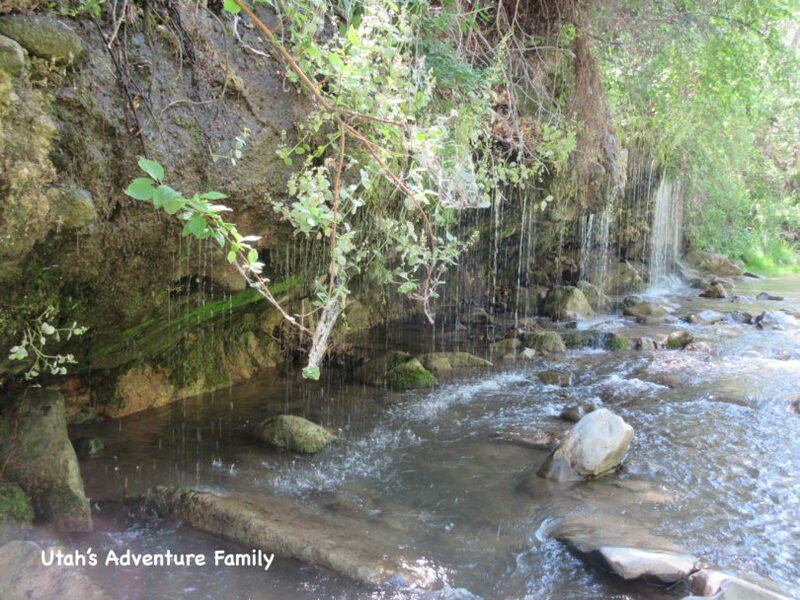 We know that a dripping rock doesn’t sound amazing, but you will be pleasantly surprised. And the best part—anyone can hike this trail because it is paved and flat and runs just over a mile roundtrip. 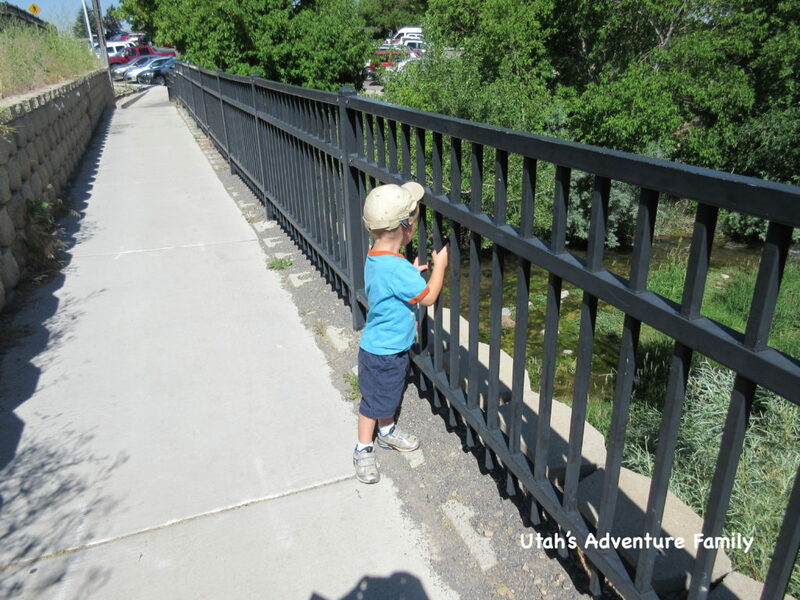 This hike can be done with a stroller and is very easy to follow. 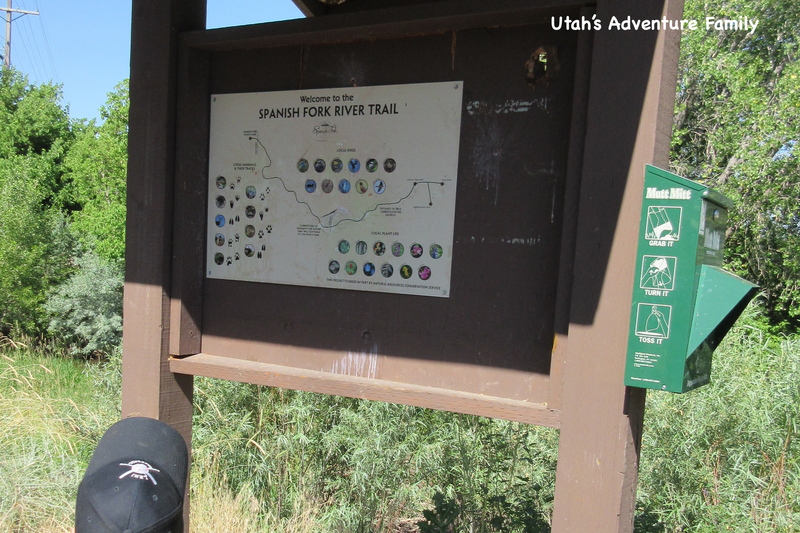 The trailhead starts at a parking lot near the Spanish Oaks Golf Course. There is a sign that talks about the trail and animals you can see while hiking. From the trailhead, cross the bridge over the small creek. 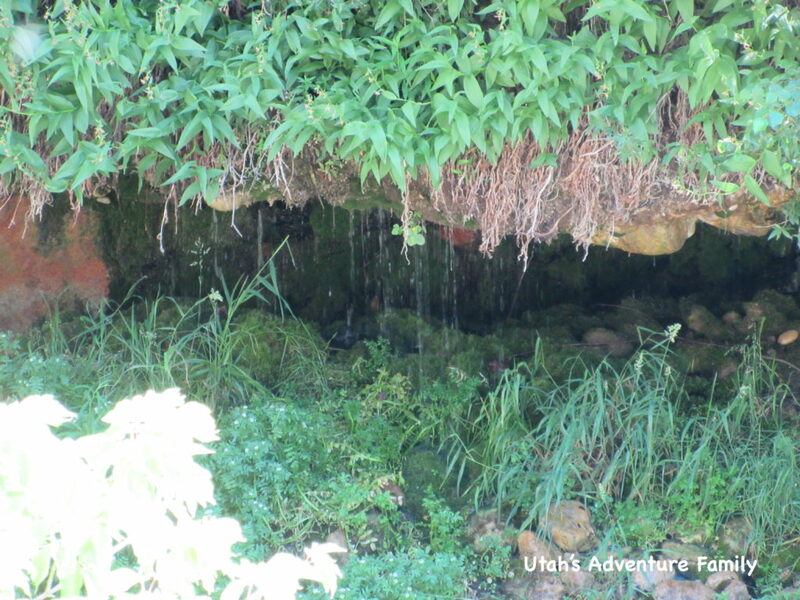 You can stop here to look for fish and frogs (which we didn’t see), but after crossing the creek, take a left through the tunnel (watch out for golf carts!) and follow the trail up to the junction. The golf carts will be coming from the right, but you need to take the first left and follow the paved path along the river. Watch for this sign in the parking lot so that you know you’re in the right spot. Cross this bridge over to the tunnel. 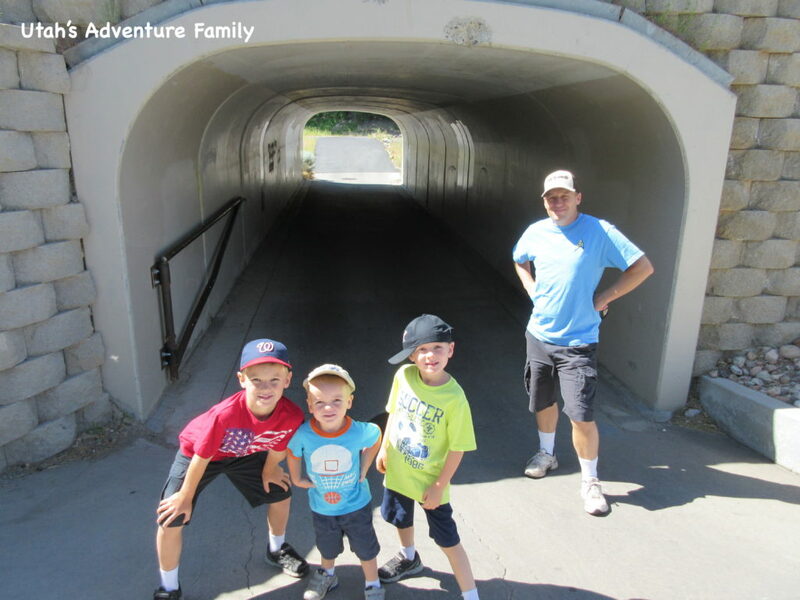 Our kids thought walking through the tunnel was pretty amazing. 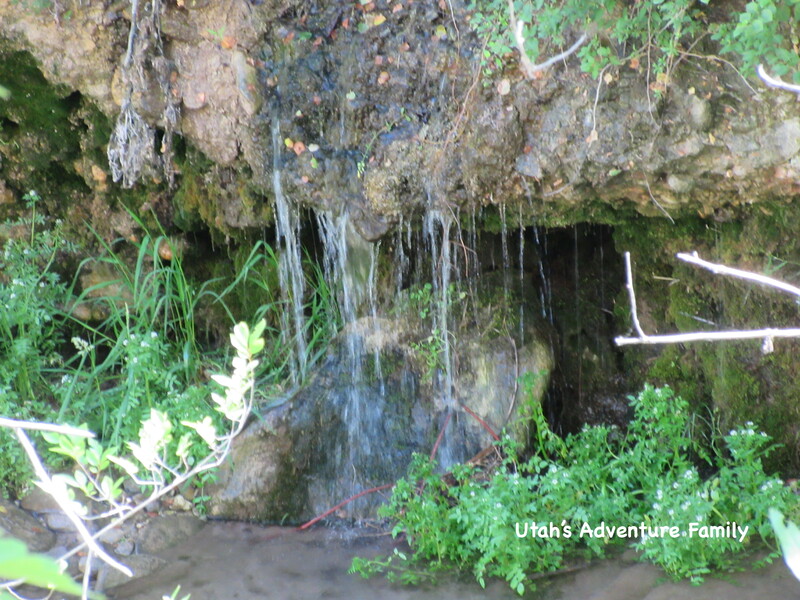 This is one of the smaller dripping rocks that we spotted. And another small dripping rock you will see from the trail. You will know you’ve made it to the famous Dripping Rock because it is quite a bit larger than the others you have already seen. There is also a makeshift trail down to the river, but be careful as it is quite a steep drop. 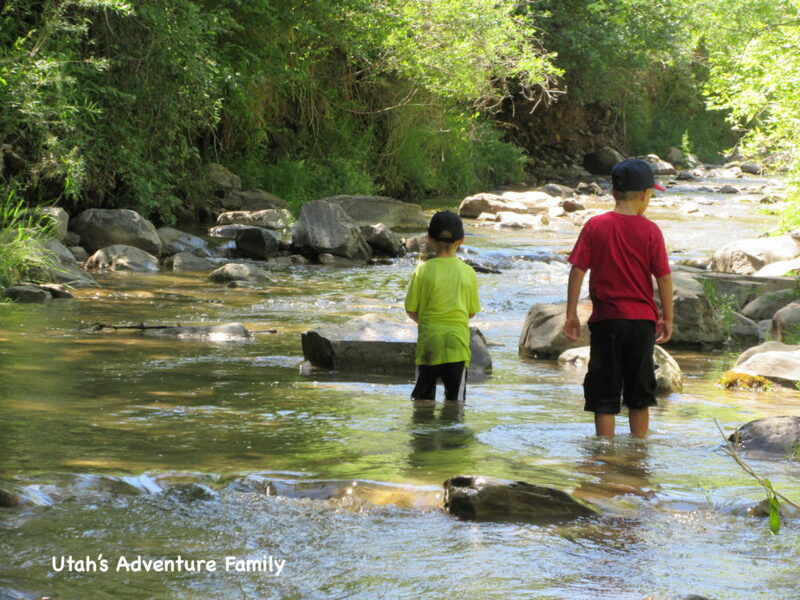 We went down and waded in the frigid water, which felt great on a hot day. The boys waded in the knee-deep (for them) water and rarely went in deeper than their chins– after awhile, falling down became quite hilarious. You can even wade across the stream and right under the dripping rock. It was so much fun! If you don’t want wet clothes, you can come in swimsuits. Our boys were quite wet when we finished playing in the river, but nearly dry when we got back to the car. The Dripping Rock is pretty cool. The water was pretty shallow, but as you can see they still got plenty wet. It was fun to walk behind the dripping water. The trail continues another 100 yards or so up to a cement barrier. 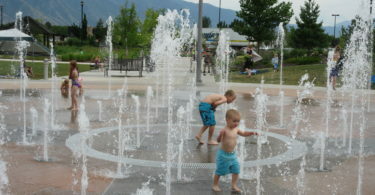 Here the water plunges dangerously into a deep pool, so watch the kids closely. There is also a lot of graffiti, and though a narrow footpath winds into the trees up the river, it doesn’t go anywhere and gets ugly pretty fast. You could possibly wade in the water up here too, but we felt like the water near the Dripping Rock was the best spot. This is the old dam/cement barrier we mentioned above. We watched the waterfall for a minute, but there isn’t a whole lot to see up here. While you are hiking, watch for squirrels and birds. We saw several birds including yellow warblers, cliff swallows, and an American Goldfinch. 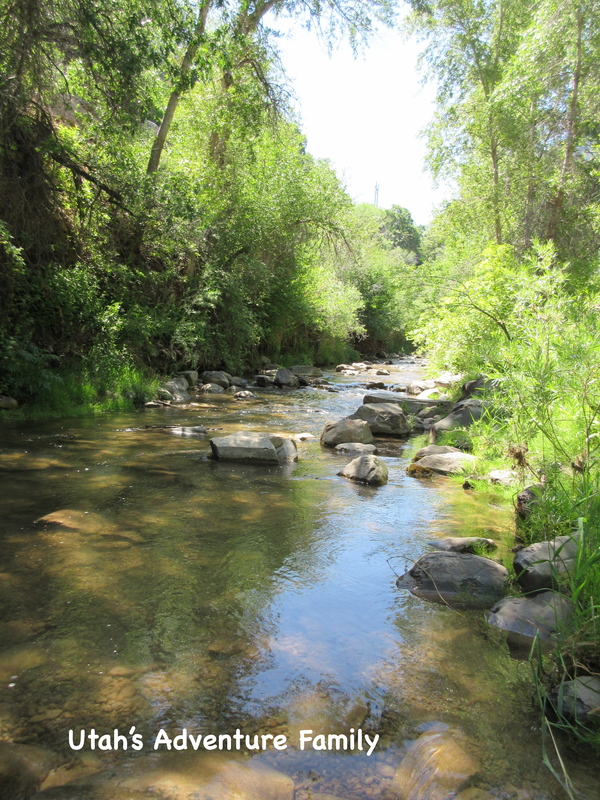 Also, there isn’t much shade, so this hike is probably best in the morning or evening–Even though the cold water probably feels better in the hot part of the day. 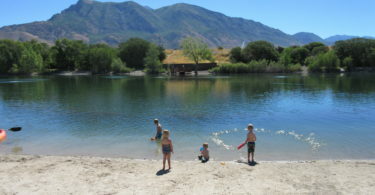 So grab a backpack, add a few towels and everyone’s flip-flops, then head down to Spanish Fork. 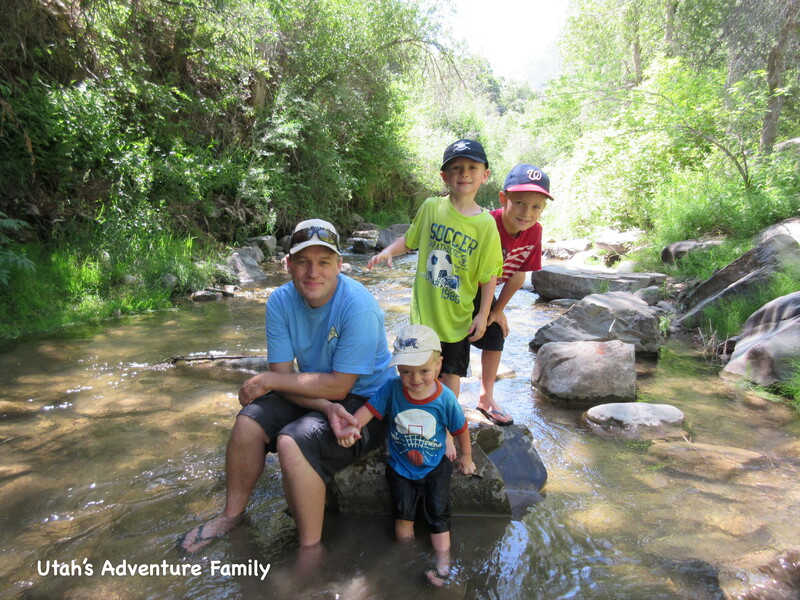 This was the perfect family adventure on a hot summer day. Went today! we parked by the Libby of the golf course and just went right under the tunnel. There’s no signs anywhere over there. Also, it’s pretty steep for littles so plan on carrying them off the trail (kind of steep but not too far.) My 3 yr old was waist deep.. ?But she had fun! Wow! Waist deep water…the river must be super full still. Thanks for sharing about your experience. They even have doggy doo bags at the start of the trail. Yes you can have dogs there. We had ours up there today. We are not sure. We have had a few people ask, but haven’t been back to check the signs and see. Sorry! Once we know, we will update the post. Drove around for hours and couldn’t find it. Why don’t you guys just drop a Google map with a pin on it into your posts. Its really easy just goto Google maps fins the spot drop a pin then share the map click on embed then copy paste that code into the website. Sorry you had a hard time finding it! We try really hard to be very specific about our directions, so we’ll look again at the post and see if we can fix it up to make it easier for you. Keep on adventuring! I love your blog! Thank you so much for documenting all of this. 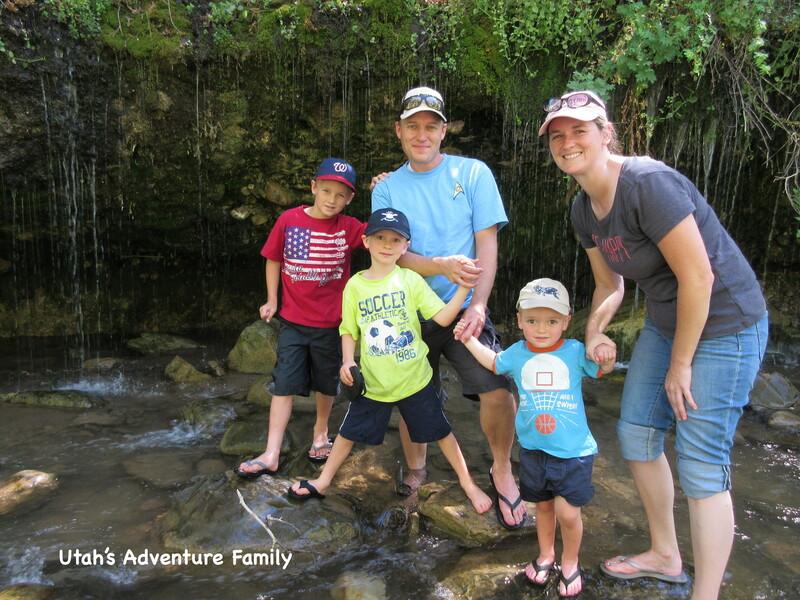 We recently moved back to Utah and look forward to many nature adventures here. THANKS SO much!!! Thank you for leaving such a positive comment! 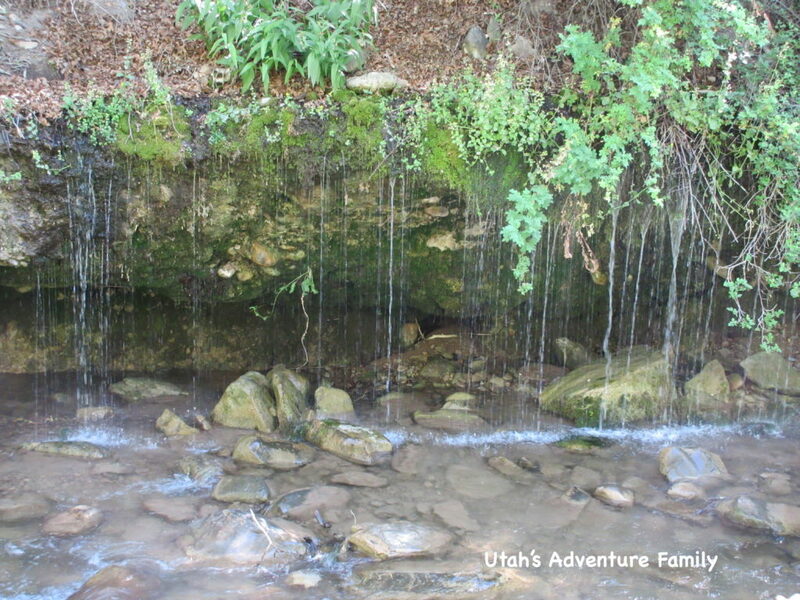 We love Utah and are glad you have moved back to enjoy it too! Did u go recently? Wondering if it’s still running or dried up by now…. We went last Friday, so about 4 days ago (late June) and it was going strong! I’m guessing it might be dried up in August, but we will have to go back and check it out. This sounds perfect! I can’t wait to take my girls up there.